It will definitely be the inscription on my headstone. I’m cool with that. To put a more accurate label on that, I’m a neurotic control freak. I’m not of the highest order, but I’m damn close. I’ve actually met a few freakier than moi. Hanging out with those nutjobs is really nice because they make me look easygoing and carefree. Anyhoo, this installment of “What’s Your Crazy?” involves my kitchen. I am one with my cooking space. I know everything that is supposed to be in that space and exactly where to find it. Of course, items don’t always get returned to their proper spaces when others clean the kitchen. My husband does like to screw with me in that he puts the drinking glasses and coffee mugs back willy nilly on purpose. It’s his little rebellion against law and order. What he doesn’t realize is that it’s really cruel. I could just let the cabinets be. I should just walk away. But. . . . . . .the obsession over the disarray and anarchy going on in my cabinets would eventually make me catatonic. And, what would that solve? Being a master at regimen and structure is a blessing and a curse. I know he secretly likes having an orderly house, a good credit rating and his underwear folded just as requested (I do this because I love him – clearly, it does not go both ways). Back to the kitchen – something very, very strange is going on in this room. Our spoons are disappearing. Not just any spoons, our teaspoons. I’m seriously losing sleep over it. I think about the missing spoons as I go to sleep and as I wake. The Flatware Tally - See anything strange??? I brought this heinous situation to my family’s attention this weekend and what response did I get? Where? Where would they turn up? Seriously. I want to know. BTW, in answer to the question floating in your head, I have checked under all of the couch cushions. Spoons don’t travel like keys or pens or phones or books, etc. 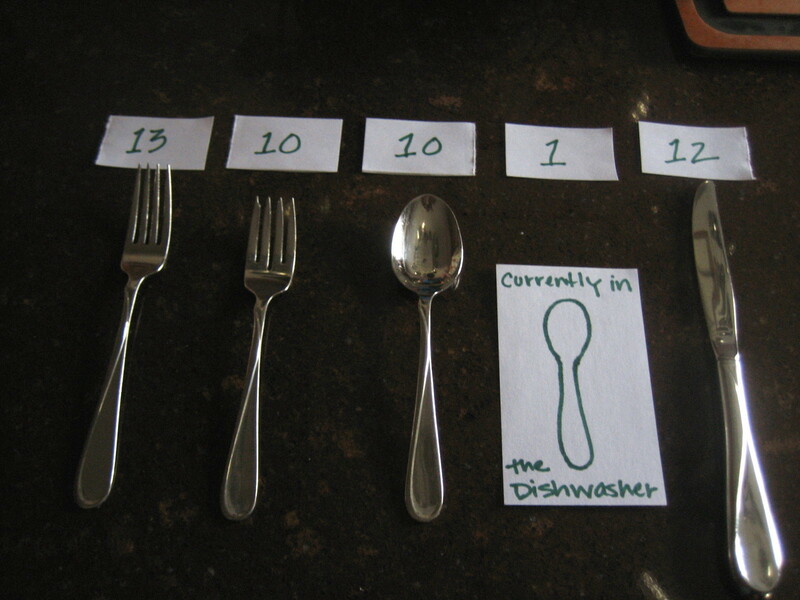 Spoons leave the silverware drawer to be placed on the table when you are dining, get transported back to the kitchen to enter the dishwasher, and then leave the dishwasher to rest in peace in the silverware drawer until they are needed again at the table!!!! Then, during my rant, Madster goes upstairs to her room just to placate me and get me to shut up. Then, she sheepishly comes downstairs with 3 of the 16 missing spoons (all big ones). [So, I’m not quite as loony as she pretends I am. HA!] She is a teenager after all. God knows what else is in there. I don’t look anymore. So, the count is now 13 missing spoons instead of 16. Ok, that’s better. NOT! Is there a black hole above our house? Are the spoons with the missing “other” sock that mysteriously disappears in the dryer? Maybe. IF I acually put my spoons in the dryer. Since no one else cares but me, I guess I’ll have to shake this one off, let it go unsolved (I may need some Xanax to get me there). I’m a little reluctant to order more – what will happen to them? This entry was posted in Everyday Life, Personal Musings and tagged everyday life, flatware, missing spoons, mysteries, postaday. Bookmark the permalink. Hmmm, I’m missing teaspoons too. this could be an epidemic!